b. 18 Aug. 1748, 2nd s. of John Mitford, barrister, of Exbury, Hants by Philadelphia, da. of Willey Reveley of Newton Underwood, Northumb. and Newby Wiske, Yorks. ; bro. of William Mitford*. educ. Cheam; I. Temple 1772, called 1777. m. 6 June 1803, Lady Frances Perceval, da. of John Perceval†, 2nd Earl of Egmont [I], 1s. 3da. Kntd. 15 Feb. 1793; cr. Baron Redesdale 15 Feb. 1803; suc. uncle Thomas Edward Freeman† to Batsford and took additional name of Freeman 28 Jan. 1809. Bencher, I. Temple 1789, reader 1794, treasurer 1795; second justice of S. Wales circuit July 1789-1793; KC 17 July 1789; chancellor, co. pal. of Durham 1791; solicitor-gen. Feb. 1793-July 1799; attorney-gen. July 1799-Feb. 1801; PC 18 Feb. 1801; PC [I] 9 Feb. 1802; ld. chancellor [I] Feb. 1802-1806; member of Board of Trade Mar. 1808. Capt. Bloomsbury and Inns of Court vols. 1798. 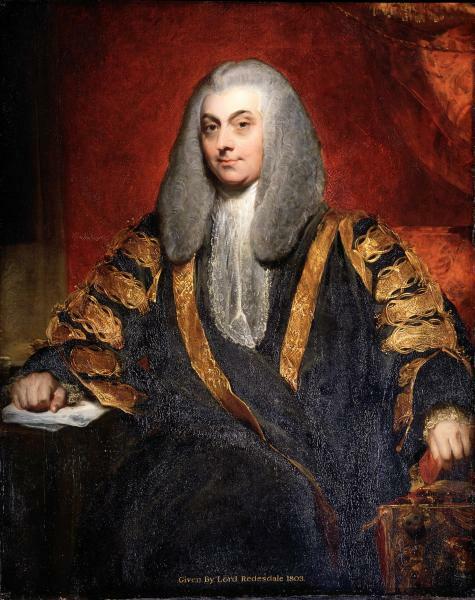 Speaker of House of Commons 11 Feb. 1801-Feb. 1802. Mitford was first placed in the six clerks’ office and became a barrister, pleading in Chancery and on the western circuit. His Treatise on the Pleadings in Suits in the Court of Chancery by English Bill (1780) made his professional reputation, going through several editions in his lifetime.1 In 1788 he was returned for Bere on the interest of his cousin Lord Lovaine and in the following year took silk as a Welsh judge. He was in general a reliable supporter of Pitt’s administration, though in December 1790, like most of his professional colleagues, he opposed the revival of the impeachment of Warren Hastings and on 14 Feb. 1791 he made matters worse by opposing the abridgement of the impeachment for consistency’s sake, an attitude that did not impress Pitt. His first significant parliamentary endeavour was the bill to relieve English dissenting Catholics by exempting them under oath from the antiquated penal statutes still in force against them. Mitford had, as he claimed, waited two years for the opening and on 16 Jan. 1791 Lord Grenville thanked him for ‘the attention which you have shown in every part of this business to the wishes of government’ and assured him that the introduction of it would not now embarrass them. For this he sought leave on 21 Feb. 1791, with Pitt’s support, and was given it on 1 Mar., though Fox objected that the bill should be applied to all Catholics and did not go far enough. The bill had a relatively smooth passage that session, though Lord Chancellor Thurlow ridiculed it; it legalized places of worship and admitted Catholics to certain minor offices.2 On 4 Feb. 1794 Mitford also obtained their exemption from a double assessment of the land tax. In March 1791 he supported government appropriation of unpaid dividends in the Bank and on 25 May opposed Fox’s libel bill, because it gave juries too much judicial power, a notion that was endorsed by the solicitor-general. He was no friend to protestant dissenters, excepting the established ones of Scotland, opposing Fox’s motion for their relief on 11 May 1792 and characterizing them on 17 Dec. as a mischievous minority. He was a critic of the Friends of the People, 25 May 1792. Perhaps a professional man ought not to be in Parliament, and I have long inclined to that opinion. I believe if the question were put to me again, originally, I should decline a seat. I am, to a certain degree, involved beyond retreat, but I cannot think of involving myself further. As solicitor-general, Mitford’s first task was the defence of the traitorous correspondence bill, March-April 1793, but he soon became involved in the multifarious business of a law officer in debate in a moment of national insecurity, as well as in the occasional defence of general measures. In October 1794 he was counsel for the crown under the attorney-general in the treason trials, for which his Chancery practice had not prepared him. He replied to Erskine (for the defence) in Thomas Hardy’s trial with some warmth of temper, a scene that was renewed at John Horne Tooke’s* trial a month later. He became convinced that such state prosecutions failed of their object. In the next two parliamentary sessions, he advocated the application of legislative coercion against radical conspirators and on 17 Nov. 1795 made a leading speech in favour of the seditious meetings prevention bill, which he shepherded through on 29 Nov., together with the King’s safety bill. 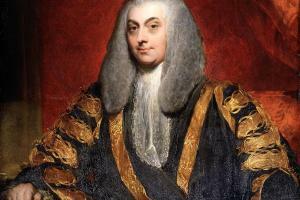 In May 1796 he justifed the government’s real succession tax. for myself I can truly say that I have repented the acceptance of that which I hold from the moment I took it, and accuse myself of having suffered ill-humour to prevail over discretion when I took it. To resign our offices at this moment might distress our friend: but all the rest we consider as a rope of sand ... For ourselves, [Sir John Scott and Mitford] I am persuaded the sooner we go the more we shall meet the public approbation. Every day, every hour, disgusts me more and more with the world and everything in it, and yet I have the folly to be pleased with the nonsense which makes me unhappy. You will tell me I should be more unhappy without it. Perhaps I should; but nothing is so pleasant as to be at liberty to quarrel with our actual situation, and so flatter ourselves with the fancy that any other would be better ... I defy you to find a man more out of humour with himself, and everybody else, yourself, par politesse, excepted. Although he remained privately critical of the ex-Whig ‘present coadjutors’ of ministry and unhappy about government’s lack of credibility and unsuitable legal appointments, Mitford resumed his post in the Parliament of 1796, subscribing £4,000 to the loyalty loan and making himself useful, as a member of the Bank committee, in the debates on specie in March 1797, in defence of the Alien Act in April, the land tax redemption bill in May and the augmented taxes in December 1797. The same month he justified the suspension of habeas corpus. On 30 July 1798 he informed Henry Dundas on behalf of himself and the attorney-general that ‘especially during the two last years ... a load of business has been thrown upon us, the weight of which we are unable to sustain’. His health and temper were being undermined by it, the attorney-general’s even more so. He regretted accepting his office, but if he was to bear it must have some relief from the considerable increase in business: ‘I must hope not to be burthened in a manner in which my predecessors have not been burthened’.5 On 14 Feb. 1799 he was an advocate of union with Ireland as the only remedy against her worn out and vicious government. On 26 June he introduced the first general combination bill to frustrate trade unions. In July 1799 Mitford became attorney-general and was provided by government with a seat for East Looe. This involved him in leading the defence of the suspension of habeas corpus in debate in February and December 1800, in introducing a bill to regulate treason trials, 30 June 1800, and in opposing Burdett’s efforts to promote an inquiry into the Coldbath Fields prison in July. He continued Lord Eldon’s policy of discouraging public prosecutions for libels against ministers as such.6 The resignation of Pitt in February 1801 took him by surprise and, even more so, Addington’s wish that he should succeed him as Speaker, 4 Feb. Addington, who would have preferred Charles Bragge*, assured Mitford of Pitt’s approbation and warned him that there was no professional alternative: the Speakership was less onerous than his law office and would lead to a peerage, which Mitford, a bachelor, could reserve for his brother William’s family. Mitford foresaw another ‘sacrifice’ and insisted on consulting Pitt and Eldon, ‘from whom I had never withheld any circumstance of my political life’, before accepting. Eldon advised Mitford to accept: if Eldon became lord chancellor, which he did not then seem to think likely, he was sure that Mitford could not compete with Pepper Arden for the office of lord chief justice, but he referred Mitford to Pitt. On 6 Feb. Pitt urged him to accept and help ‘arrangements’, a term Mitford did not then ask to have defined. After another interview with Addington, he wrote to Pitt ‘leaving him to decide for me’, 6 Feb. He frankly informed Pitt that he did not think Addington’s government could last and he expected to see Pitt back in power. Asking Pitt whether he would have proposed him for Speaker, he reminded the ex-minister that the Speaker’s salary could only meet the expenses of the office and that, thinking it imprudent to fall back on the £30,000 that was his by inheritance, he did not wish to lose sight of his professional prospects: if he took the Chair pro tem., on retirement he would sink below his former professional situation, after nourishing ‘notions of independence, which perhaps are foolish, but which at present I am not disposed to give up’. Pitt, in his reply of 8 Feb., urged Mitford to regard the Speaker’s chair as a superior honour and to give his aid to an administration founded on ‘the principles on which we have all so long acted’. Finding Pitt anxious that he should overcome his private scruples, he was disconcerted when he saw Addington the same day and discovered that Pepper Arden was going to obtain the common pleas, which would vacate the mastership of the rolls, and that Addington ‘combated with great and unusual earnestness’ Mitford’s preference for the rolls, which was earmarked for (Sir) William Grant*. It was then that Mitford, denied in turn the common pleas and the rolls, the latter of which was both the place he thought himself best qualified for and the prize of his profession, began to feel that the Chair was being foisted on him as a convenience for others in parliamentary management, without reference to his own prospects. He was right: Addington would by then have preferred Abbot as Speaker and been content to give Mitford the rolls, but Pitt wanted him to be Speaker and barred his way to professional promotion. The King thought that he would make a good Speaker, with practice, but his year in the Chair was not particularly happy. With reference to the fracas during the debate on Horne Tooke’s eligibility to sit in March 1801, Glenbervie reported that his ‘inexperience, or some warmth in his temper’ were at fault, and of his brushes with Fox and others: ‘It is observed that he uses his eye and hat too little; and his tongue too much, and that from inattention or awkwardness he neglects or suffers others to neglect established forms’. (But Glenbervie had an eye to the Chair himself and thought in December 1801 that he might get it by Mitford’s succeeding Alvanley as lord chief justice). Procedurally, Mitford emphasized two conventions which he wished to encourage, the giving due notice of motions, particularly those to produce information, and the avoidance by Members who had already spoken in debate of repetitive amendments in conclusion. On 13 Mar. 1801 he gave his casting vote for the committee on poor relief. Whether deliberately or not, he showed some attention to Irish problems: the new situation created by the parliamentary union was certainly a contributory factor and the application of martial law to Ireland another.8 The upshot was that on the death of Lord Clare, he succeeded him as Irish chancellor in February 1802, with £10,000 and a pension of £4,000. He had made ‘the bitterest complaints’ at not becoming master of the rolls the year before, not least when it was put about that he had refused them, and was now to be placated. Lord Pelham thought the appointment ‘next to the Union, the greatest blessing to Ireland that can be imagined’, as Mitford was ‘the best equity lawyer in the profession’; Eldon thought it ‘the greatest boon that has been conferred on Ireland’. In short, the appointment was ‘generally approved’, though it meant overlooking a strong Irish candidate, Lord Kilwarden. William Wickham, who had collaborated with Mitford in the battle against sedition, went with him as Irish secretary. Yet Mitford doubted at first whether he should accept and asked Addington, whose own idea it was, to decide for him. On 10 Feb. he accepted a peerage, setting a precedent for retiring Speakers.9 On 19 Feb. he was introduced to the other House as Lord Redesdale. Redesdale was subsequently left an estate by a relative and became a pillar of reaction in the Lords, where he obstructed every proposal for legal reform suggested by the humanity of Sir Samuel Romilly. His own debtors relief bill of 1813 was well intended, but did not work. Radicalism and Catholic Ireland remained his pet bugbears. He showed a keen interest in the preservation of public records and in the history of Parliament, ‘the child of custom rather than of principle’.11 He died 16 Jan. 1830. 1. E. B. Mitford, Life of Lord Redesdale (1939), 7. 2. Glos. RO, Redesdale mss D.2002 C4; HMC Fortescue, ii. 13, 41, 42, 55, 89; the bill became 31 Geo. III c. 32. 4. PRO 30/8/170, ff. 163, 167-9; Sidmouth mss, Mitford to Addington, 11 Feb., 6 July 1795; Farington, i. 202; iv. 249; Brydges, Autobiog. i. 159. 5. Sidmouth mss, Mitford to Addington, 9 Jan. 1797; Kent AO, Stanhope mss 730/5, Mitford to Pitt, 26 Oct. 1796; SRO GD51/1/282/1. 6. Twiss, Eldon, i. 358. 7. Redesdale mss X9, Mitford’s memo, 7 Jan. 1802; PRO, Dacres Adams mss 4/13; Sidmouth mss, Mitford to Addington, 10 Feb. 1801; Pellew, Sidmouth, i. 301, 304; Glenbervie Diaries, i. 166; Geo. III Corresp. iii. 2350, 2354; Colchester, i. 226-232; Plunket, Life, Letters and Speeches, i. 227. 8. Geo. III Corresp. iii. 2397; Glenbervie Diaries, i. 198, 299; Debrett (ser. 3), xiv. 137, 427; xv. 86; xvi. 39, 169, 251. 9. Redesdale mss X9, Mitford to Hargrave, 13 Feb.; E. Suff. RO, Tomline mss, Rose to bp. of Lincoln, 22 Nov. 1801; Add. 33114, f. 107; 35712, ff. 84, 88; Twiss, i. 401; NLS mss 11054, f. 14; Pellew, i. 479; Geo. III Corresp. iv. 2585, 2587, 2794; Grey mss, Tierney to Grey, 11 Feb. .
10. Mitford, 57; Redesdale mss X11, Redesdale to Perceval, 8 Mar. 1802; C8, same to same, 20 Mar. 1804; Pellew, ii. 96, 206, 253; PRO 30/8/170, ff. 203, 207, 215, 219; Colchester, i. 417, 436, 464, 475, 485, 523; D. Gray, Perceval, 19, 51-52; Farington, ii. 149; Add. 35718, f. 85; 49188, f. 163; HMC Fortescue, vii. 188, 268-9; viii. 25; Geo. III Corresp. iv. 3425. 11. Romilly, Mems. ii. 147, 162, 185, 225, 293, 332, 396; iii. 74, 95, 108, 146, 188, 190, 215, 253; Colchester, ii. 522; iii. 27, 40, 47, 55, 57, 60, 64, 107, 303, 323, 341; Mitford, 32, 236.